Among the differences between the House and Senate chambers – beyond the most obvious that there are twice as many representatives and thus twice as many desks on the House floor – is the rule about guns in the gallery. Ordinarily, it doesn’t make much difference; on Tuesday, it did. Much of the Capitol, like most of the state, is “open carry” so it’s not unusual to see people walking around the grounds, gathering on the north steps of the Legislative Building or meandering into the domed structure with a rifle in arm or a handgun at the waist. There are some who consider this a bit unusual because protesters with picket signs must remove the sign from the stick and leave the latter outside before entering the building. The Second Amendment does not guarantee the right to keep and bear sticks. 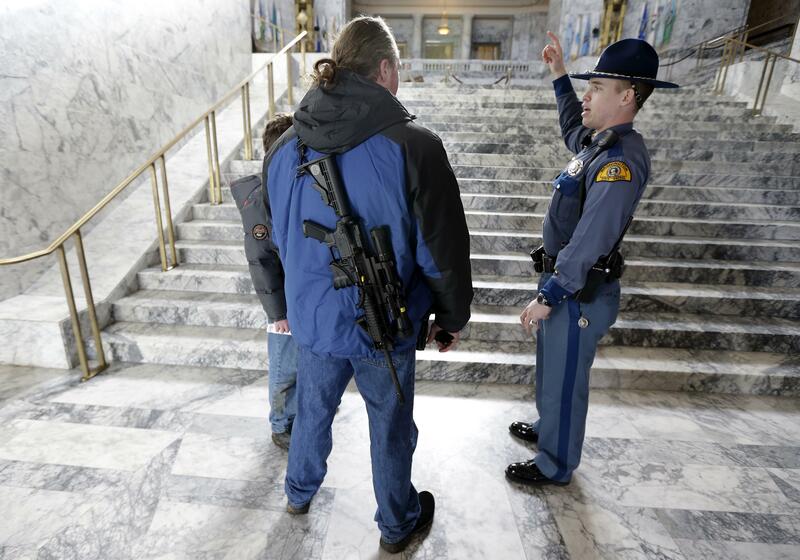 People openly carrying weapons can stroll around the Rotunda or congregate in the hallways, but cannot bring their firearms into the galleries above the House and Senate chambers. This rule was enacted several years ago in reaction to a significant number of well-armed protesters in the galleries who had some lawmakers below thinking some weapons were being pointed at them. The protesters have insisted that wasn’t the case and some anti-gun legislators were just being Nervous Nellies, but even some strong Second Amendment backers in the chambers were not happy with activities in the gallery that day. House and Senate leadership, who set the rules for their respective galleries and committee rooms, instituted “no open carry” rules for those spaces, which were arguably in keeping with restrictions against bringing props to make a point. But those rules didn’t apply to concealed weapons. In late 2017, Lt. Gov. Cyrus Habib, who presides over the Senate, added a ban on concealed weapons in the Senate gallery. There’s no good way to tell if this rule is followed most days because there are no metal detectors in the building and no patdowns before entering the gallery. There’s a sign warning against bringing a gun in, and security would eject anyone whose concealed weapon became unconcealed. The House does not have a similar ban on concealed weapons. On Tuesday, that difference mattered. Habib, who normally presides over the joint session in the House for the State of the State address, asked that the House gallery be closed for safety reasons. He’s had some concerns at events away from the Capitol in the past, owing in part to his ban on concealed weapons in the Senate gallery; being blind, he’s not as able as sighted people to recognize a threat and react quickly. House administration turned down his request to close the gallery, which for any State of the State address is filled with visiting dignitaries, family members and former elected officials. There was some back and forth first. The House chief clerk’s office said it agreed with the Washington State Patrol to some extra security protocols but wouldn’t close the gallery because there was no specific threat. Habib declined to attend the ceremony, so presiding duties fell to House Speaker Pro Tem John Lovick. All other statewide elected officials and Supreme Court justices attended, however, and if there were any concealed weapons among the audience, they remained concealed. This prompted Senate Republicans to take verbal shots at Habib in the post-speech news conference. Senate Minority Leader Mark Schoesler said he’s more worried walking around downtown Olympia than in the Capitol, and there would be no reason to fear the speech audience because most of them would be good Democrats who support Gov. Jay Inslee, so presumably they wouldn’t be packing. They also made a point of saying the standard introduction of visiting foreign dignitaries, like consuls who came down from Seattle offices, was skipped in the switch of emcees. Republicans tried to make up for it by saying “Hi” at the news conference. Washington Supreme Court Chief Justice Mary Fairhurst stunned the legislators gathered for her annual State of the Judiciary speech when, near the end of her remarks, she announced she is, once again, battling cancer. Fairhurst beat colon cancer that had spread to her lungs and was declared cancer-free about five years ago. The colon cancer has returned and reappeared in her lungs, she told the hushed assembly, but she’ll continue on the job and asked for prayers. “I still believe in miracles,” Fairhurst said. Anyone watching Monday’s opening ceremonies for the House might have noted a line in the invocation by Rabbi Yohanna Kinberg, asking for prayers for Rep. Bob McCaslin. But if you stayed with the TVW broadcast long enough, you might’ve caught sight of McCaslin in his chair on the House floor. Here’s what happened. Shortly before the start of the session, McCaslin, who is diabetic, had a bout of low blood sugar. Fellow House member Rep. Dan Griffey, an experienced EMT, noticed McCaslin wasn’t doing well and provided some aid until the ambulance arrived. His blood sugar got built back up but they took him to the hospital for a quick check, gave him a medical OK, and he was back on the floor before the ceremony was over. He missed the official swearing-in of all House members, but Justice Charles Johnson stuck around to administer his oath of office right after the chamber cleared.